thanks so much, dear Jeanette! i m so happy you like it, dear Shige! thanks ever so much! 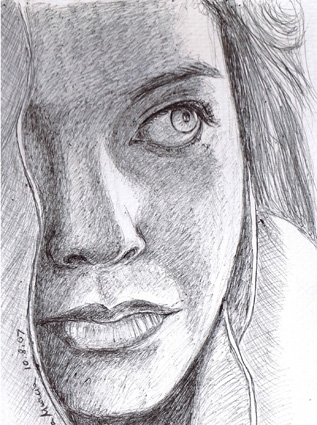 I think that it is very difficult to draw the portrait with a ball-point pen, but this is very good. there was a time that i loved drawing with this type of pen so much that i was super lazy to come back to pencils!!! i like the fact that it is so responsive to slight changes in preassure! For me, it seems to be difficult to draw it with a ball-point pen. The reason is because it cannot delete it unlike a pencil. Ha-ha. i agree! and that is the challenge! it is tricky but addictive! I may be short of challenges. no way! you are sooo talented, for me it would be a challenge to do any of the wonderful portraits you do! many thanks for your comment. I do not forget challenge mind. thanks so much i really appreciate your comment, you are so kind! You're very welcome my friend AliciaMurcia ! thanks so much, dear Lise! thanks so much!!! i just checked out your gallery, you pictures made with gemstones are amazing!!!! very beautiful work alicia!!! !thanks for adding me as one of ur favourite artists!!!! i'm soooo glad!!!! thanks! And of course I added you as a favourite, I really like your work!! Have a fantastic weekend my dear friend! you are welcome dear and thanks aloooot i really appreciate ur comments!!! !wish u a great weekend!!!! thanks! the same to you!!! thanks so much, i m happy u like it! thanks so my my dearest mag!!! just come into work today! i had Monday and Tuesday off, so it is a short week for me I hope you have a great week my friend!! merci!! i truly appreciate your comment!! thanks so much! and great gallery. i like your work! !